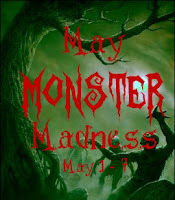 Quite a few years ago, I ran a little website called Haunted Ontario. It wasn't something I ever planned on doing . . . it just sort of happened. I was researching 'real' haunted locations around the province to use as background material for a horror novel I was writing, and I ended up amassing this incredible amount of research material. After I'd sent the manuscript on its way (and awaited the inevitable rejection letters to come), I decided to do something with all the stories I had collected. And with that what-the-hell attitude and initiative, Haunted Ontario was born. This was before the ghost-hunting craze began taking off, so the site was kind of unique at the time. For me, the fascination lay in the stories themselves, the history behind them, and in the imagery of their locations. At least once a month I would drag my loving wife (who has always managed to summon some genuine enthusiasm for my strange quirks, fetishes, and obsessions) all over the province on road trips to find these out-of-the-way, hard-to-find, creepy locations. It wasn't about actually seeing or feeling a ghost, and I never once sought to capture something spectral on film (no matter how excited some people got about 'orbs' and 'shadows' and 'spectral mists' later). Instead, it was just about being there, experiencing the history, and trying to capture the architecture of the location in a good photo. 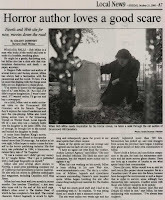 Once the ghost-hunting craze began to invade the mainstream, I became something of a Halloween celebrity. 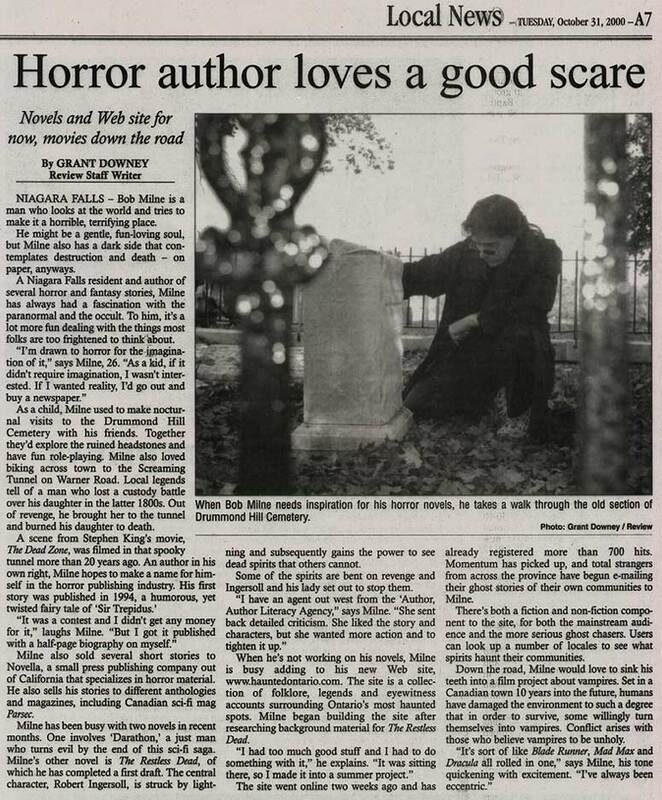 For a few years I was in all the local newspapers, spoke at a number of events, took part in some haunted tours, did a few radio shows, got a photo credit in the second Haunted Canada book by Pat Hancock, and even got my 15 minutes of TV fame one morning in Breakfast Television. It was a lot of fun for a while, but when it became increasingly clear people were more interested in their ghost-hunting gadgets and psychic impressions than in the stories themselves, I just lost interest. 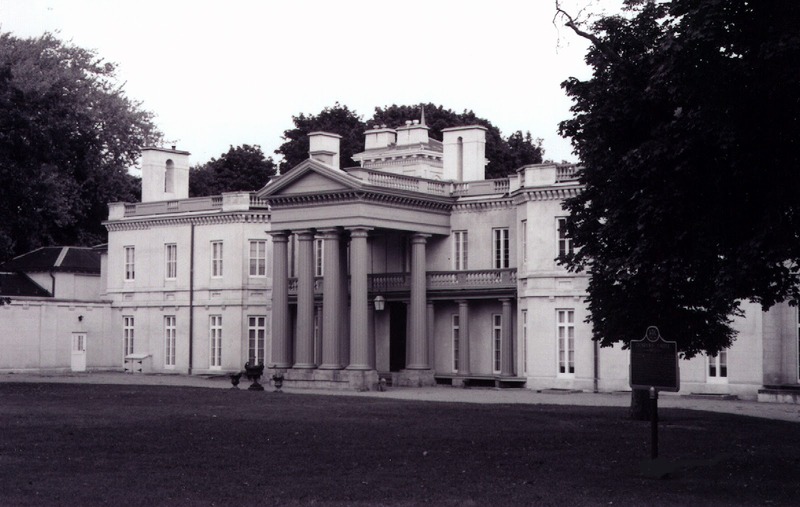 An honest-to-gosh Canadian castle, Dundurn Castle is a sprawling estate that dates back to the early 1830s, built upon the ruins of an earlier home, and situated on a plot of land said to be consistently occupied for thousands of years. It's a location that's steeped in history, including multiple hangings across the street and nearby 'plague sheds' where cholera victims were confined to die. It's best ghost story is a simple one, though, involving the original owner's second wife slowly wasting away from consumption in an upstairs bedroom. It's said that there are cold breezes in her room that blow out candles, that objects upon her dresser move about on their own, and that the soft sound of singing can be heard from her bed. The Gibraltar Point Lighthouse is a piece of Toronto history, nestled away within a secluded forest clearing on Toronto Island, just a few minutes walk from the Centre Island amusement park. 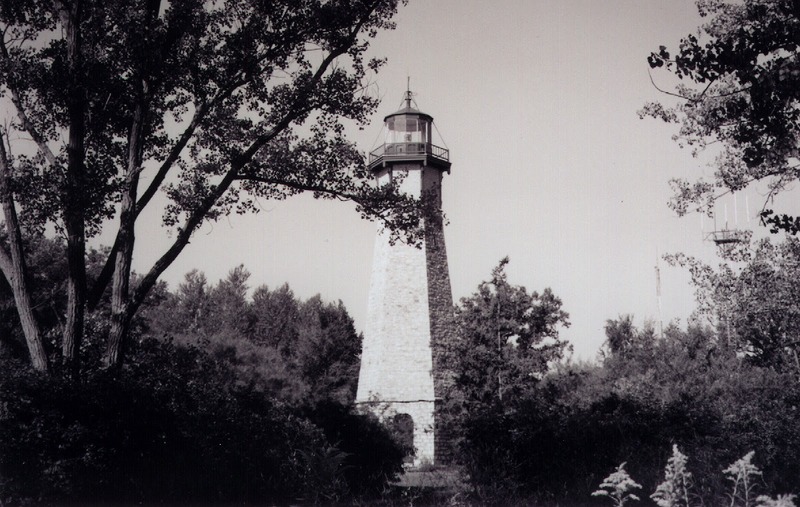 Originally built in the early 1800s, it featured a wooden lamp structure that wasn't replaced with steel until 1878, and which didn't see its first spark of electricity until 1916. The legend here surrounds it's first keeper, a man by the name of J.P. Radan Muller who is said to have been murdered by drunken soldiers from nearby Fort York, looking for bootlegged booze. They chopped up his body and buried it on the beach - where a wooden coffin containing only a jawbone was found nearly 100 years later. It's said the sound of moaning can be heard from about the lighthouse, that a spectral figure can be seen walking the grounds at night, and that his lantern can be seen swinging about on misty nights. 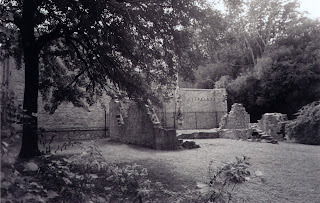 The ruins of what remain on the site today were originally constructed in the mid 1800s, consisting of a large stone house, a farmhouse, a ban, and several other buildings. While there have been ridiculous rumours of satanic rituals and orgies about the ruins, it's best ghost story involves a tragic romance between a young female tutor and the black slave who loved her - who later hanged himself from a nearby willow tree when she did not return his affections. It's been said that ghostly footsteps haunt the ruins, that people feel watched, and that the slave himself can be seen wandering from the crossroads where he was buried to the edge of the ruins. This is one of my favourite locations, and one of the area's greatest ghost stories. 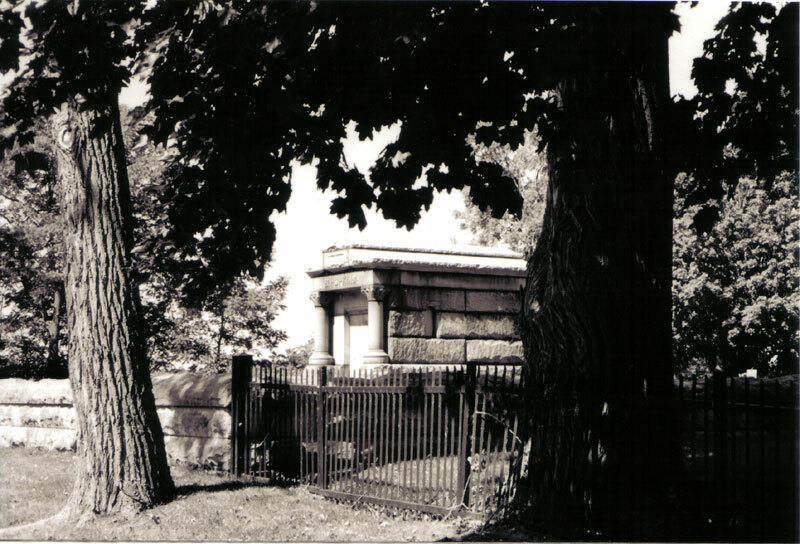 Samuel Hopkins was a local businessman whose died before the mausoleum he'd ordered constructed could be finished. Temporarily buried nearby, his remains were later unearthed and relocated to the tomb - along with, the legend says, his very-much-alive dog. Hopkins himself is said to haunt the ruins on the Spring Equinox, and his dog is often said to be seen guarding the entrance. The best part of the story, though, is that he is said to have laid a curse upon the tomb, and that anybody who steps within its foundations will suffer an accident. Over the years, visitors who have chosen to test the curse have suffered mysterious (and gruesome) accidents, including one who lost an arm and another who lost a leg. The only way to break the curse, it's said, is to circle the tomb seven times, knocking upon the door with each pass. Finally, we come to Drummond Hill Cemetery, just a short walk from where I grew up. The site of one of the bloodiest battlefields of the War of 1812, with over 1,700 American and British soldiers left dead after a long day and night of battle that saw the American forces retreat to Fort Erie. Already a cemetery at the time, with its oldest tombstone dating as far back as 1797, it's population soon swelled with the graves of soldiers from both sides. It's said that a procession of 5 soldiers can be seen marching down the hill and into battle . . . and that a similar group, reduced to 3 and clearly dishevelled, can be seen marching back from the old tavern across the street. These are just a few of the stories that captured my imagination, and a few of the locations that first introduced me to the beauty in ruins. Have a favourite ghost story of your own? Please leave a comment below! Love the drummond hill pic. Always love a good spectral story! I've started doing the same kind of research / field trips here in Texas. I'm working on several stories about TX lore & legends. Oh, what fun it is!!! 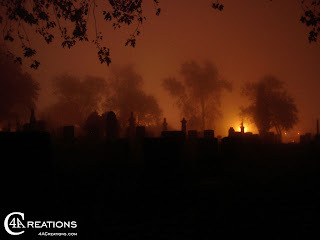 I love a good ghost story too, and your photographs are beautiful! I've never been ghost hunting, but I have had a couple of personal ghosty experiences. Nice article. I love that you included photos as it gives a visual reference. I have never had a ghostly encounter but two different co-workers had experiences at Gettysberg, PA staying in hotels next to the battlefield. One went when she was young and played with a little girl in dressed in what she thought was Amish garb, only to be told there was no little girl there. Another was when the co-worker and her brother were in the hotel room and the brother went to go to the bathroom and there was a soldier dressed in uniform that was glowing.